Resolver One is a new spreadsheet, designed to make it easier for people to build the systems they need - even in these days of declining IT budgets. Today Resolver Systems announce their $25,000 Resolver One Challenge: a competition awarding up to $17,000 to the person who shares the best spreadsheet with the world. Today Resolver Systems announces the $25,000 Resolver One challenge, a competition to reward people who share their best Resolver One spreadsheets with the world. Each month between now and May, they will award $2,000 to the best spreadsheet submitted -- and in May, an award of $15,000 will be made to the best of the best. "With Resolver One, you can do so much more than a normal spreadsheet", explained Robert Smithson, co-founder of Resolver Systems. "You can build web applications; Resolver One contains its own web server. You can run scenario analyses. You can put software objects -- .NET and Python -- directly in cells. In other words, forget everything you previously thought about spreadsheets, the constraints of the last 25 years are gone. You can build complex, rich applications, in a familiar spreadsheet environment." 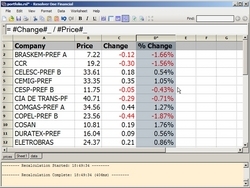 Resolver Systems was founded in 2005 to produce a next generation spreadsheet. The founders, Giles Thomas, Robert Smithson and Patrick Kemmis, had all struggled with the challenges of running multi-million or multi-billion dollar businesses through poorly debugged spreadsheets. Their solution - Resolver One - seamlessly integrates a powerful and flexible programming language and a traditional spreadsheet environment. Resolver One is used by companies in the financial, oil exploration and pharmaceutical industries, and in academia.